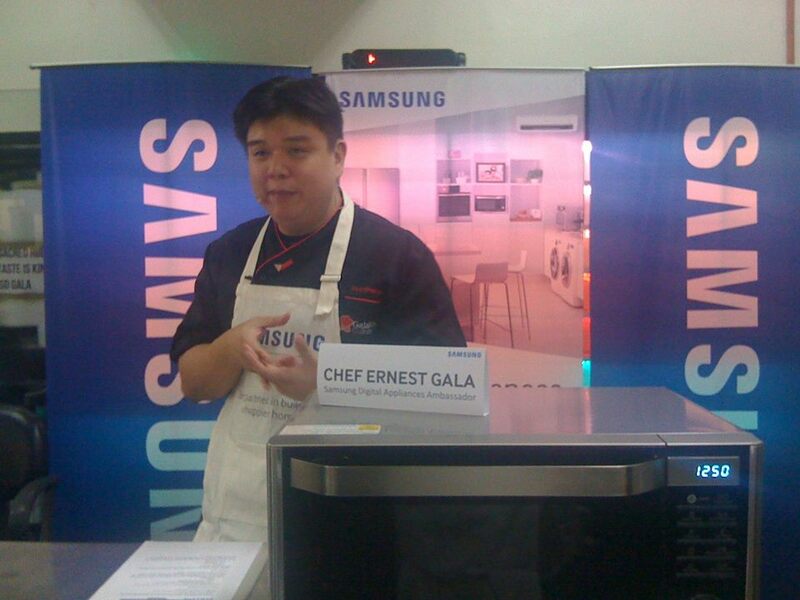 I join in the 8th Samsung Digital Appliances Cooking Workshop at the Gala Stars Culinary School yesterday. For this month, Samsung wanted to showcase trick-or-treat worthy dishes that will surely entertain the kids and kids at heart. For our Halloween Party Dishes, we were group into tandems and made to occupy the cooking stations. We were given the Spooky Halloween Burgers and Spider eggs to make. Chef Ernest Gala did an actual demo on how to prepare these dishes in the most convenient and easy way using Samsung Smart Oven’s functions. The Microwave and Microwave with Grill Functions of Samsung Smart Oven made this hamburger variation fun and easy to do. I love its Slim Fry Technology that allows oil-free frying and fuss-free frying and grilling. Less oil means healthier food for my family. Samsung Smart Oven's all-in-one cooking solution, takes microwave using several notches higher. At home, we use microwave ovens mostly for its reheating functions other than making popcorns. it is nice to know that I can do kitchen wonders with the Samsung Smart Oven. I look forward to leveling up my cooking skills with this appliance. Chef Ernest then taught us to his halloween take on the classic devilled eggs. The shelled hard-boiled eggs are cut in half lengthwise, and filled with the eggyolk's mixture of mayonnaise plus seasonings. It was so good that I can make an entire meal out of it! I had a blast mounding the yolk mixture into the whites. And decorating it with spiders made from black olives made the feat even more enjoyable. 3) Procedure: After mixing, form into 4 balls. Flatten out into patty. Set SAMSUNG SMART OVEN on MICROWAVE+GRILL FUNCTION.Time 4 minutes. Press start. Invert patty and set on MICROWAVE+GRILL FUNCTION. Time 4 minutes. Add cheese on each patty. Press GRILL FUNCTION. Time 20 seconds to 1 minute. 4) Put on prepared lettuce lined bun. Serve. 1) Boil 6 eggs in water for 12 minutes. When eggs are done put in ice water for 30 seconds. Gently peel the shell. Cut in half lengthwise using knife or French fry cutter. Remove egg yolk. Set aside. 3) Add egg yolks. Transfer to pastry bag with star tip. Pipe out on 12 eggwhites shells. Top with meat sauce and black olives (olives cut in the shape of spiders). 4) For the Meat Sauce: Put in a microwavable bowl 1 cup meat sauce. Put in SAMSUNG SMART OVEN. Cover with wrap. Set on microwave mode on high and time 2 minutes. Remove wrap. I'm glad to learn on Samsung's kitchen solutions to the ever-changing daily needs. 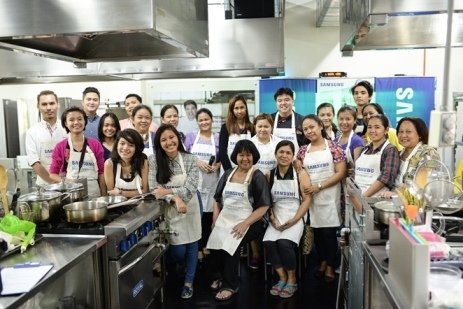 I'm excited with new learning experiences on preparing healthy food at a time with Samsung Digital Appliances.